Changes are being made to the encryption infrastructure that secures the Eduroam network. Wireless devices require a configuration update to ensure uninterrupted network access. These changes are schedule for April 11th. Failure to run the update in advance may result in an interruption of your Eduroam access. 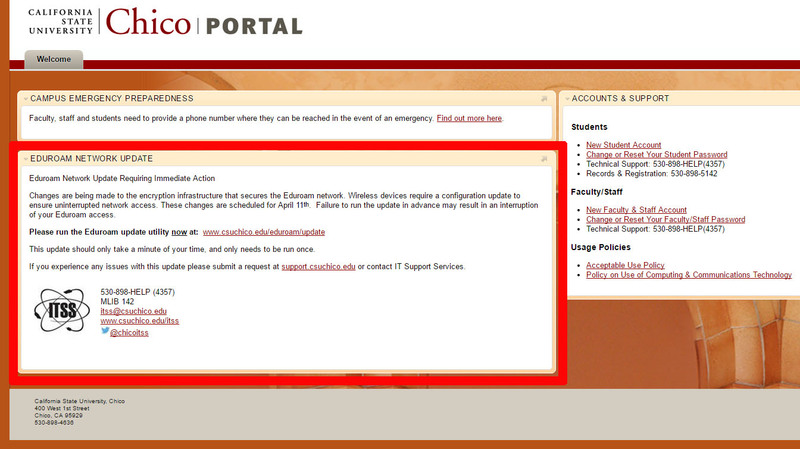 Please log into your CSU, Chico Portal account and follow the “EDUROAM NETWORK UPDATE” instructions. Please run this update on each of your mobile devices. It should only take a few minutes of your time.